You may find it very weird if suddenly you have something rising to the surface of the neck, armpit, or even groin. These things can hurt you and of course, make you worried if the hurt feeling is becoming clearer and clearer. But don’t worry because they may not dangerous tumors, just swollen glands. You can easily treat it by using some natural home remedies if discovering soon. Glands are basically lymph nodes that are a part of the lymphatic system or a component of the body’s immune system. Swollen glands are often a signal of the infections. Lymph nodes may arise singly or in groups of different sizes. Normally, lymph nodes are small, soft, and bean-shaped and they are mostly found in the neck, under the chin, in the armpits, or in the groin. The reasons for the swollen glands are the infection that can increase the number of lymphocytes in response to stimulation from the foreign particles or due to the inflammation in the areas of the lymph nodes, colds, coughs, flu or even from cancer. Lymph nodes are pretty hard to feel; however, swollen lymph glands can cause painful, red, hot blocks under the skin, make you more tired than usual, skin rash, unexplained weight loss or cause fever and sweat at night. 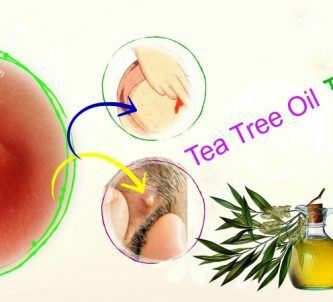 Don’t worry, the swelling phenomenon is normal and luckily, there are many ways to treat the swollen glands even treatment is taken place at home. In this article, Effective Remedies will introduce the list of 25 most effective home remedies for swollen glands in the neck & throat. Keep reading the writing to get more useful information to cope with this disease. 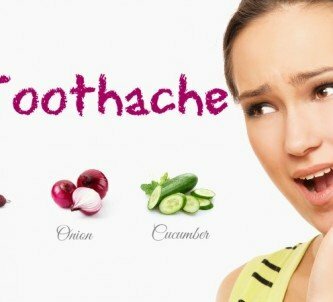 36 most effective home remedies for sore throat pain – 100% natural! We have already known that hot temperature has an effect on increasing blood circulation that makes heal wounds faster, which delates the blood vessels, muscles, & ligaments and reduces the stimulation of the nervous system. All of these lead to an analgesic effect. Thus, you should utilize heat as one of the home remedies for swollen glands by putting a warm compress on the swollen lymph node areas. Besides, if it is possible, you should soak or wash the affected areas directly in the warm water for several times per day to speed up the treating process, or more easily, you can use a bottle with warm water inside to compress on the swelling. However, you need notice that each time of the warm compress should be at least 3 hours apart since the continuous application will make the skin soft, open pores and bacteria easily penetrate, causing dermatitis, inflammation of the muscles. Massage is clearly a wonderful way to relax, and relieve pains. In the case associated with lymphocytes, massage will have an effect on promoting the lymph flow and the function of the lymph nodes, helping the body easily dispose of toxins, harmful substances, waste, and bacteria. Besides, it also assists in boosting the blood circulation, reducing swollen glands in size, and easing the pain in the affected areas. 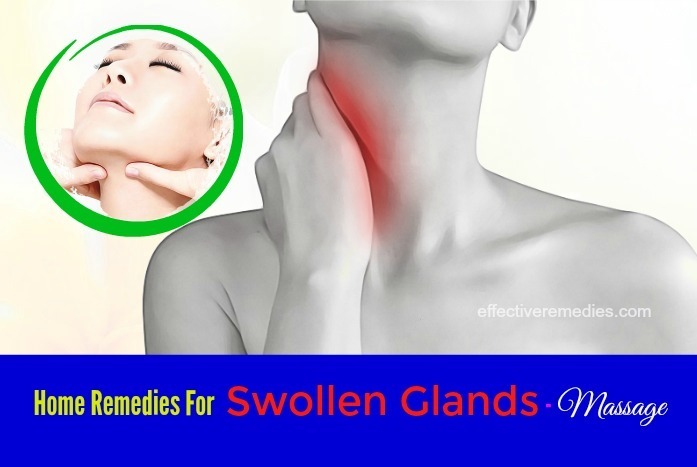 Therefore, massage can be considered as one of the simplest home remedies for swollen glands. It will be better if you are massaged by therapists based on the manual lymphatic drainage. In case, you cannot afford, massage by yourself at home is still a good treatment for the swollen glands. However, we highly recommend that if you currently have an infection, diseases outside the skin, fever, blood clots or heart failure and kidney failure, you should not massage the lymphatic system, since this can make the lymph flow function too fast, which causes these parts to be more weaken. Additionally, cancer patients should not massage as well to avoid the increase in the blood circulation leading to the growth or diffusion of cancer cells. Another of the effective home remedies for swollen glands you should follow is using lemon. Not only is lemon beneficial for women’s beauty but it also has great effects on protecting the overall health, such as treating coughs, flu symptoms, and significantly intensifying immune systems . Besides, lemon juice contains the acid that effectively reduces swelling. Thus, if swollen lymph nodes are making you a sore throat and swollen throat, you should utilize lemon juice immediately to treat them. Drinking this infusion is extremely good, but in the morning with an empty stomach, you should not add too much lemon juice or forget to add honey, since this can cause stomachache due to the acid in lemon. You should do this 2-3 times per day until the swollen glands are gone. This solution can effectively help to remove swollen lymph nodes and clean your mouth and teeth as well. Castor – the tree originated from India has experienced many effective effects on improving digestion, reducing dysentery and enteritis, relaxing muscles associated with menstrual cramps and treating swollen glands as well. Castor oil that is pressed from its seeds is a viscous liquid with an unpleasant taste, but it is very useful to reduce the swelling of lymph nodes. Thanks to fatty acid- ricinoleic, castor oil can inhibit and eliminate many types of viruses, bacteria, fungi, and yeast . Besides, the acid has anti-inflammatory effects that reduce swelling and tissue or joint damage. Therefore, it is a perfect idea for you to apply castor oil as another of the natural home remedies for swollen glands. Salt is never absent in the lists of the ingredients that are very beneficial for killing bacteria or reducing swelling and inflammation. Thus, you should not ignore this cheap but useful spice to cope with the swollen gland phenomenon. Salt water has an antiseptic effect, enhances the pH environment, and prevents bacteria growth (since bacteria need low pH environment to grow) . Thereby, gargling with salt water is a simple way to limit infection, inflammation, and sore throat . Besides, swollen tissues will be dehydrated, which also helps reduce inflammation and provide a pleasant sensation. Therefore, in order to treat swollen lymph nodes, utilizing salt water is one of the best and simplest remedies for you to apply at home. This solution should be done regularly every day. You may be surprised by its effects on the swollen glands. Even if you are not suffering from the swell, gargling with salt water daily is highly recommended since it can clean your mouth and make your teeth stronger. Honey is very well-known for its marvelous functions in beautifying and taking care of the health. We have already known that one primary reason for swelling of lymph nodes is bacterial contamination or infection. Thus, using the ingredients having antiseptic and antimicrobial properties like honey is a smart choice for treating swollen glands . Thanks to the antimicrobial effect of honey, it has been effectively used in the ancient times as a cure for colds, coughs or sore throats and additionally, it also has the ability to kill bacteria that cause the inflammation and swell. Whereby, taking honey can both prevent the risk of catching the diseases and heal the swollen lymph nodes. This method is very simple, so you should apply it 2-3 times per day until the swell is completely gone. Drink it twice per day in the morning on an empty stomach and before bedtime. This solution can also assist in cleaning your gut and strengthening your immune systems. Thus, keep doing this method even after your swollen glands disappear. However, if you are suffering from a certain health problem or taking some medications, you should consult a doctor before using this herb. If you want to know more, please stay with us and keep reading in the next part of this article. The next home remedy for swollen glands is using apple cider vinegar. We already know wonderful functions of the apple cider vinegar in taking care of the skin, but additionally, apple cider vinegar has great effects on treating swollen lymph nodes. PH level plays a very important role in the balance of the body while apple cider vinegar helps to maintain alkaline, which assists the body in avoiding energy loss, infection and intensifies immune systems . Moreover, apple cider vinegar enables to break slimy substances inside the body and clean lymph nodes and eliminate wastes in order to avoid the swelling of the glands. Therefore, applying apple cider vinegar will help to kill the bacteria that cause the swollen glands and reduce distending. Notice: Although apple cider vinegar is a natural and healthy product, you should use in the recommended dosage, since the use of excessive amount of apple cider vinegar can lead to a gastric ulcer and an intestinal damage. Using 15 ml of apple cider vinegar per day is the right dose to achieve its effects. Many people love cayenne pepper flavor and see it as a great spice. But almost surely, very few people know cayenne pepper has a powerful effect on treating headaches, sore throat, inflammation or relieving pain and so on . Therefore, cayenne pepper is often listed in the effective home remedies for swollen glands. In this case, one of the most outstanding ingredients of cayenne pepper is capsaicin that acts as aspirin, significantly contributing to pain relief and inflammatory alleviation. Whereby, cayenne pepper has been widely used for treating the diseases that are related to inflammation or pain, such as arthritis, osteoarthritis, heavy menstrual bleeding, and swollen lymph nodes. You can combine cayenne pepper with lobelia extract to increase blood flow to the swollen lymph nodes. Keep doing these solutions regularly to get a great improvement. Panax ginseng is very precious and nutrient and is most widely used as an herbal medicine in the Orient. In addition to its ability to take care of the skin or provide much nutrition for the body, Panax ginseng is also extremely beneficial for treating the symptoms of a cold & flu. You already know that the flu and cold can cause the swelling of lymph nodes, so Panax ginseng has the capacity to heal the swollen glands and fever. Moreover, ginseng can intensify the immune system, limit the growth of viruses, and possess anti-inflammatory properties that will reduce the swell of any tissue on the body . 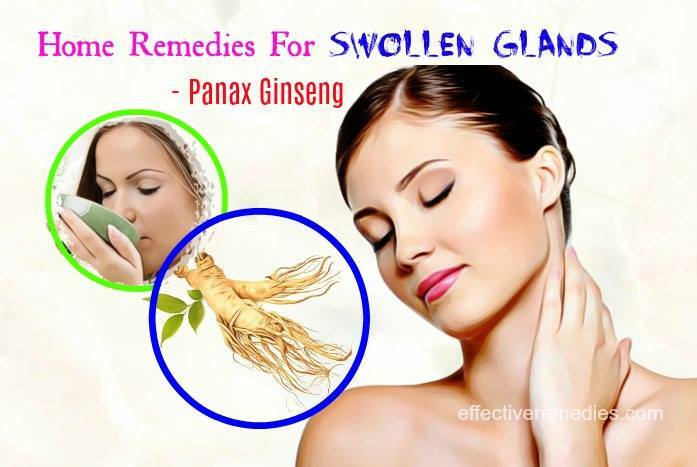 Whereby, using Panax ginseng as a home remedy for swollen glands is highly recommended. You can find Panax ginseng available in the form capsules, liquid extract, and powder. Take about 400 mg of ginseng daily until the symptoms of cold, flue or swollen glands are noticeably improved. Panax ginseng is truly beneficial for health if you use it regularly. However, kids, pregnant females, those who are suffering from diabetes or blood pressure should avoid this herb. Another ingredient you should apply for treating swollen glands is Mullein – a wonder plant because all of its parts such as its roots, leaves, and flowers generally possess healing properties. So, it is largely used in treating respiratory disorders, asthma, bronchitis, allergies, a cough, a sore throat, and swollen lymph nodes. In details, Mullein has the anti-bacterial properties that make it effective in treating infections and prevent the diseases caused by bacteria, including a cough, sore throats, flu, and swollen glands. Besides, this plant consists of anti-inflammatory and calming effects, which are able to considerably soothe the irritated skin areas and reduce the swell and pain. Thus, the anti-inflammatory and anti-bacterial properties make this herb a great treatment for a sore throat caused by hypo-immunity or lymphatic stagnation and swollen glands. Drink this solution for 3 times daily until realizing a satisfactory result. To make better taste, you can add its flowers. Any excessive amount of the tea can be stored in the refrigerator for the future use. Notice: Never use mullein seeds to make tea or oil because of their toxicity. Echinacea is a beautiful kind of flowers that are originated from North America and classified as an herb. One of the most outstanding benefits is treating colds and its symptoms such as swollen lymph nodes very effectively . The reason why echinacea is such a wonderful herb is that it has the ability to boost the immune system and fight infections. The United States Department of Agriculture Natural Resources Conservation Service reports that echinacea has the great influence on the immune systems, which helps to destroy bacteria in the body and prevent more migration. Thus, this helps to reduce the chances of catching a cold and decrease its duration . Moreover, echinacea possesses anti-inflammatory effects as well, which helps to treat the swell of any tissues in the body . Besides, this herb can contribute to pain alleviation, especially for insect bites or sore throats while it also has antimicrobial properties that strengthen the lymph system and fight infection by purifying lymph nodes. Therefore, thanks to these characteristics, echinacea is considered as an effective home remedy for swollen glands that you should not ignore. Or drink 1-2 cups of echinacea every day until the swollen lymph nodes disappear. This solution is very good for overall health not only for swollen glands, so you should keep doing it regularly to get a better health. 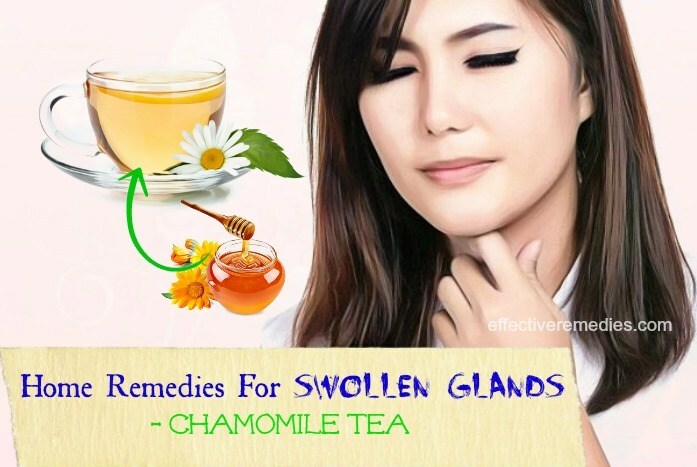 If you want to treat swollen glands effectively and easily at home, chamomile tea is highly recommended for you. Chamomile tea is very well-known for the functions of helping with diabetes, soothing stomach ache, fighting cancer, promoting healthy skin, and calming muscle spasms. Apart from those, this tea also makes it so effective in reducing the irritation of eczema, acne and lymph nodes thanks to its anti-inflammatory and antiseptic characteristics . Besides, chamomile tea possesses the antibacterial and antimicrobial properties that can help to prevent and treat colds, coughs or other diseases and infections related to bacteria (such as swollen glands) while it also has the ability to strengthen the immune systems . More interestingly, this herbal tea can reduce anxiety and depression and make you sleep better. Thus, drinking chamomile tea every day is the top advice for you to boost your health, take care of the skin and treating swollen lymph nodes as a useful home remedy. If you love the smell of garlic, you will find that garlic can make very good tastes for dishes and provide the body with a big content of vitamin A, B, C, D, and other necessary minerals. Additionally, using garlic is considered as a wonderful treatment for many diseases such as flu, cough, sore throat, asthma, diabetes, rheumatism, arthritis, thrombosis, hypertension, etc. The properties making garlic very useful are antiseptic, anti-inflammatory and antibiotic properties in it. In fact, garlic contains an antibiotic ingredient – allicin that can destroy viruses and boost the immune systems . Attar of garlic is effective in sterilizing and preventing inflammation; so, garlic is widely used to treat swollen tissues or even acne on the face . Thanks to these wonderful characteristics, garlic is always listed in the effective home remedies for swollen glands. You should not place garlic too long because it may cause burn and redness on the areas. 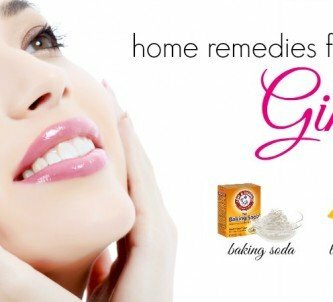 If you are patient to do this solution regularly, you will remove hateful swollen glands on your body soon. An alternative remedy is that you add garlic in daily meals to make them taste more delicious and achieve the gradual effectiveness in treating the irritated lymph nodes. Another home remedy for swollen glands you should notice is applying turmeric. Surely, many girls use turmeric to take care of the face skin and get satisfactory results. However, more surprisingly, turmeric also has outstanding properties to treat the swell of lymph nodes anywhere on the body. The most noticeable property of turmeric is curcumin – the great component against bacteria, viruses, fungi. Besides, it also possesses antibacterial & anti-inflammatory effects, which is the reason why turmeric is popular for getting rid of acne on the face . Therefore, just using fresh turmeric or turmeric powder can destroy bacteria causing the swell and reduce the irritation of glands effectively. Keep doing this solution regularly for 1-2 times per week until the swollen glands disappear. If you are suffering from swollen glands caused due to a sore throat, this method is for you. Drinking the liquid including turmeric inside is really good for the health. Thus, even you are not suffering from swollen glands; it is still useful for you to apply regularly. 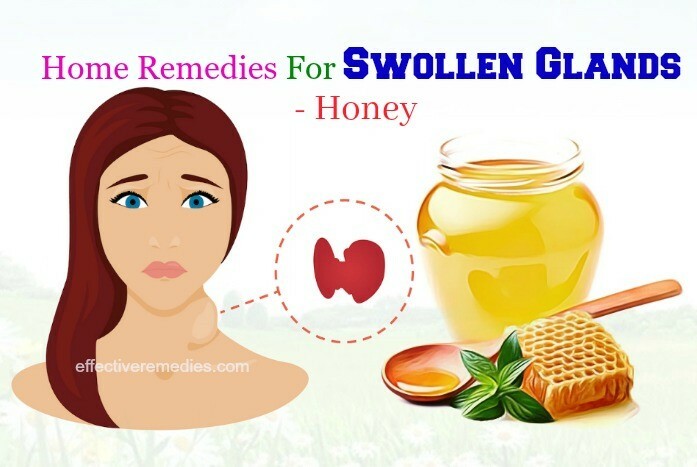 Those are all of the most effective home remedies for swollen glands in the neck & throat you can simply apply at home. Normally, these solutions can help you to reduce the swell of lymph nodes within 1-2 weeks if the swelling state is not improved; you should consult a doctor soon to get more specific treatments. For the natural treatments of other health condition, please visit our Home Remedies page. Feel free to leave your comments in this article. 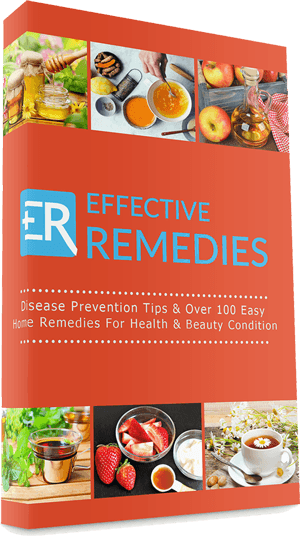 33 Natural Home Remedies For Rashes On The Body – Do They Work?